Most renowned artists follow the market and live in large cities where major art buyers can be exposed to their work – not so for Denmark native and award-winning painter, Jim Harrison. 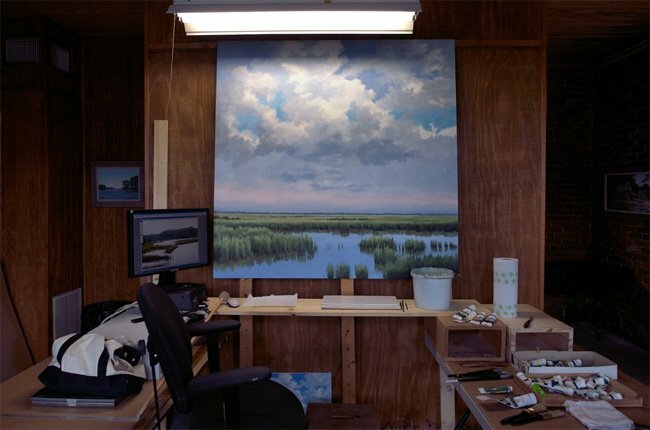 Harrison, who was educated at Denmark High School and the University of South Carolina, took an unorthodox road to his career that ultimately led him not just back to his hometown but to the very building where he first connected with a paintbrush. 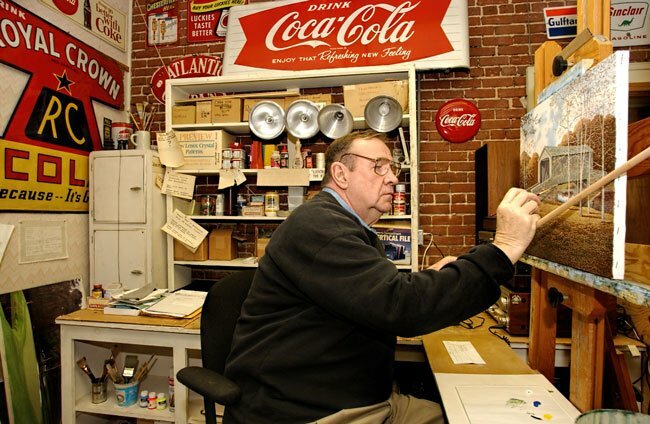 One of America’s foremost artists of rural scenes, Harrison began as an apprentice for sign painter J.J. Cornforth, painting the Coca-Cola logo on local buildings. 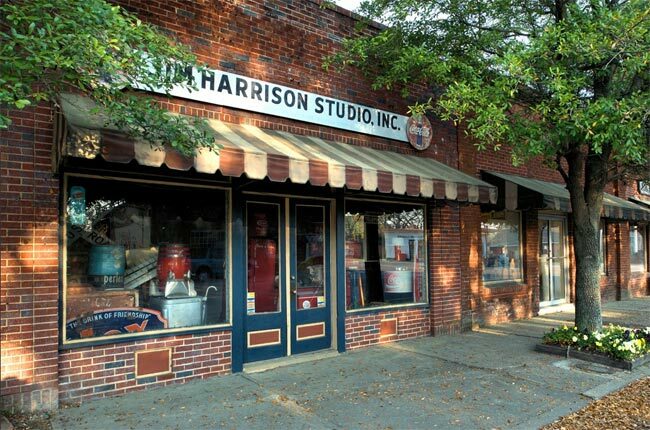 Harrison’s mother saw potential in her son and purchased an art kit to encourage his artistic pursuits. As much as Harrison loved art, however, he saw a future in teaching and coaching and decided to major in physical education in college. Upon graduating from USC, he successfully led three South Carolina high school football teams during his eleven-year stint as a coach, at Bamberg High School, Orangeburg High School, and Elloree High School. Harrison’s career in education led him to befriend Allendale art teacher Zita Mellon, who inspired him to take his art seriously, not simply as an avocation but as a possible profession. Thanks to Mellon’s influence, the more he painted, the more he felt pulled to pursue art as his life’s work. In fact, the pull was so strong that Harrison turned down an assistant coaching position at Furman University in order to return to Denmark and paint. His first foray into the world of professional art was in 1970, when Harrison and his wife, Margaret, traveled to New York City for the fall Greenwich Village sidewalk art show. He sold only one piece during that first show, but undeterred, Harrison continued to produce scenes of his home state until his print, “Coastal Dunes,” was published in the 1970s. Following his success as a limited edition print artist, Harrison kept painting and eventually became associated with Hammer Galleries in New York, actually selling out his first show there in advance. The public was hungry for Harrison’s rural buildings and landscapes – scenes that continue to define southern Americana – and his good fortune during that first show at Hammer was replicated in subsequent shows there and in San Francisco. 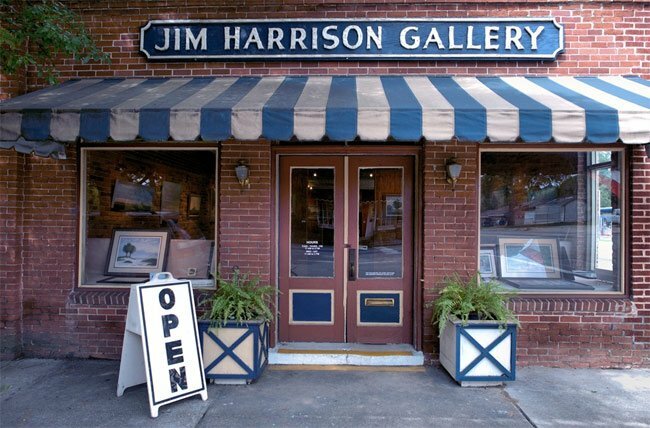 Harrison heeded his calling, creating originals while also selling prints of his timeless classics at the Jim Harrison Gallery in Denmark, situated in the shadow of the town’s iconic water tower (which he also designed) and in the same building where J.J. Cornforth first ignited Harrison’s passion for art. When he was not greeting art lovers in his gallery, Harrison could be found working in his studio in the back of the building. Harrison’s contributions to South Carolina led to his receiving the Order of the Palmetto, the highest honor awarded to a civilian in South Carolina, in 2008. 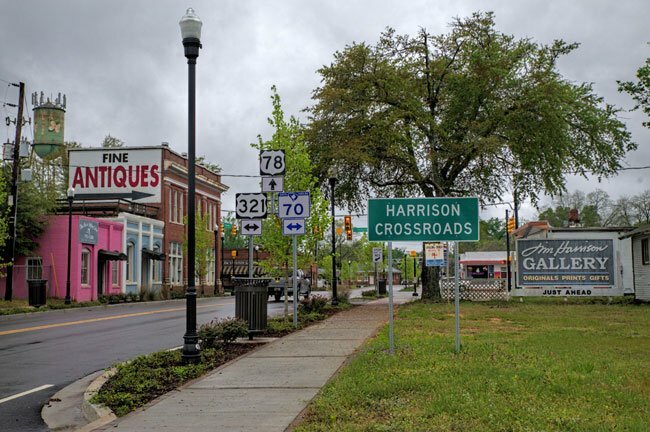 His popularity in his hometown resulted in the naming of the intersection of United States Highway 321 and United States Highway 78 in Denmark “Harrison Crossroads.” Sadly, Harrison died on June 18, 2016 of an apparent heart attack in his gallery office. 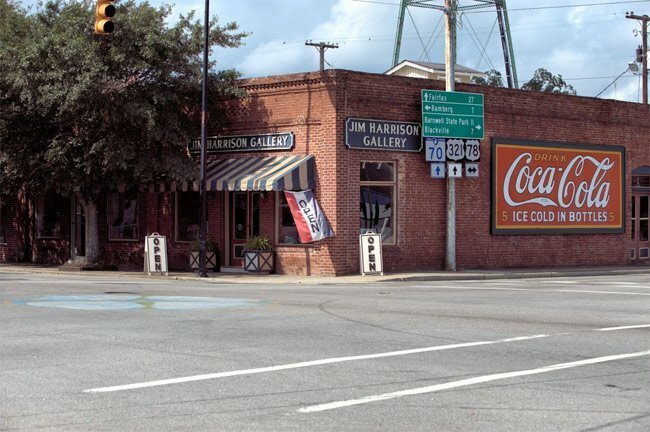 The Jim Harrison Gallery is located within an historic building in Denmark, South Carolina. 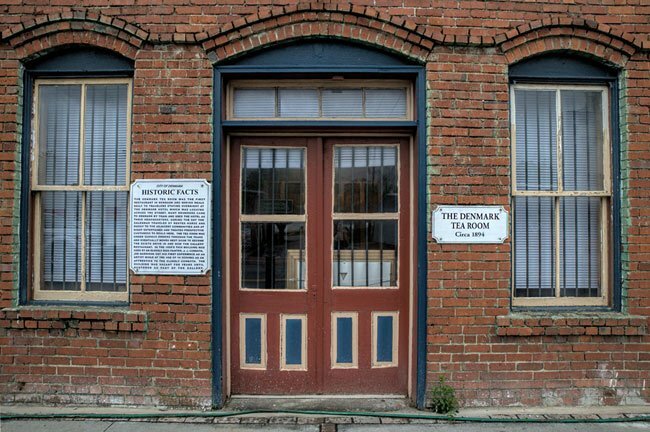 Built in 1894, the brick gallery was first known as the Denmark Tea Room. Travelers staying at the Denmark Hotel across the street would dine here before retiring for the night. 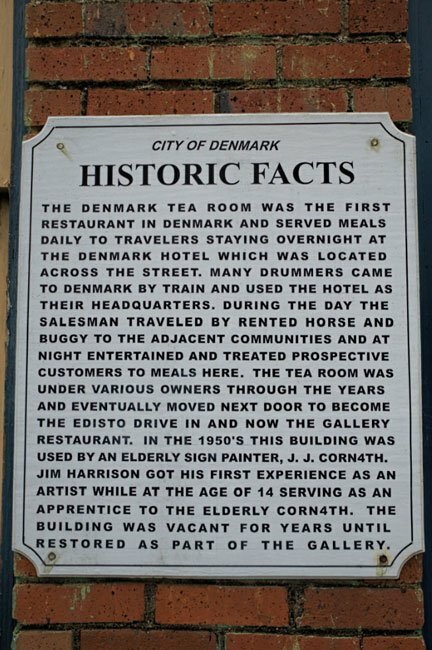 The Denmark Tea Room operated here for decades under different owners before moving into the building directly behind it; that business eventually became a diner called the Edisto Drive-In. During the 1950s, the building was used by sign painter J.J. Cornforth. Harrison spent a good part of his youth painting for Cornforth in this very building. Following a period of vacancy, Harrison eventually made the building the site of his own gallery, continuing to paint here until the time of his death in 2016. The Tea Room was resurrected in the early 2000s with a seasonal restaurant operating from the back of the gallery. The cafe opened for lunch on Saturdays during August, serving sandwiches and salads; it is now closed. Jim’s passing a very sad time indeed. I spent a full day in Denmark this past April photographing many things and places for him for which he had plans to add more charm to his beloved town. I've have the pleasure of working for Jim since 2003. Not only is he a great artist but a real gentleman as well.